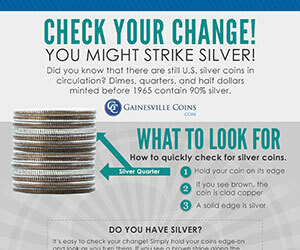 Striking Silver May Be As Easy As Searching Your Pocket Change. We'll Show You Which US Quarters, Dimes, Nickels And Half-Dollars Contain Valuable Silver. Learn about the ongoing economic crisis in Greece with this helpful infographic. Find out the many potential risks of Greece defaulting on its loans. 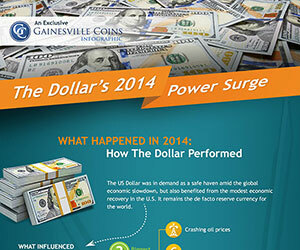 The U.S. dollar was by far the world's best-performing currency in 2014. This infographic helps explain the "how" and "why" behind this development. 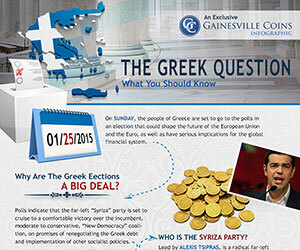 Explore this infographic, exclusive to Gainesville Coins, about the Greek economic crisis. The visuals and information will explain the crisis. ECB QE: What's It All About? Infographic about the national referendum in Switzerland aimed at repatriating all gold reserves and putting Swiss Franc on fractional gold standard. As the Earth's population explodes, developing nations demand better living conditions. Resources become more expensive and more scarce. Anatomy of a coin infographic. The parts of a coin with each part labeled and types of coin edges. Coin educational tool to teach parts of a coin. Washington quarters infographic. Find valuable treasures in your change that make them worth much more than their face value. Roosevelt dimes infographic. Find valuable treasures in your change that make them worth much more than their face value. Jefferson nickel infographic. Find valuable treasures in your change that make them worth much more than their face value. Lincoln cents infographic. Find valuable treasures in your change that make them worth much more than their face value. Your guide to American Gold Eagle. Learn all about gold eagles with this handy infographic. Gold bars infographic. Find out the difference between poured and pressed gold bars. Learn the differences between poured and pressed bars and the different types of bars available at Gainesville Coins. Your guide to american silver eagle, the official bullion coin of the United States, and the most popular pure silver bullion coin in the world. Check out our handy Infographics section, for colorful and user-friendly explanations of coin-related subjects. We even give you the embed code for each infographic, so you can easily share with friends! We'll be adding new infographics periodically, so come back to our learning center often for new information.